Okay, for some of you this tool may be unnecessary. 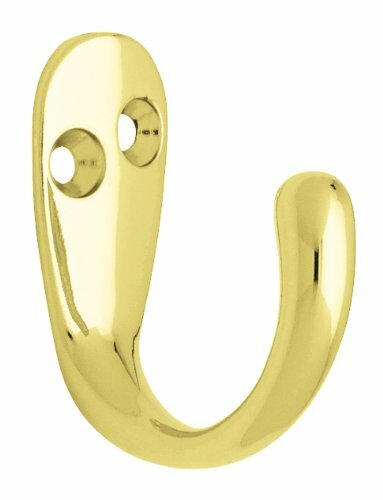 But whenever I have installed hinges, coat hooks, or anything else that requires a centered hole, I always seem to be just a hair off. I would carefully mark with a pencil, then use a punch to mark the hole, drill it carefully, and voila, I’d end up with screws that were almost centered . . . every time. Christopher Schwarz recommended this Starrett Punch, but I balked at the price tag. But I tried it, and I am glad I did. A built in mechanism does the punching for you when you’ve depressed the tip all the way—a spring-loaded mechanism punches sharply. the one-handed operation. Unlike the cheaper centering punch I tried before this one, I don’t need one hand to hold the punch and one to hit it with a hammer. I can use this one on a vertical surface. I am installing coat hooks this week on a vertical surface. I can hold the hood with my left hand and punch it with the right hand alone. I just push. the punch itself is sharp and makes a workable hole. I can adjust the force and i can re-sharpen it if necessary. the mechanism requires that the diameter of the barrel be significantly larger than a simple punch. With some applications, this punch has a hard time fitting. I wouldn’t go back to anything else. 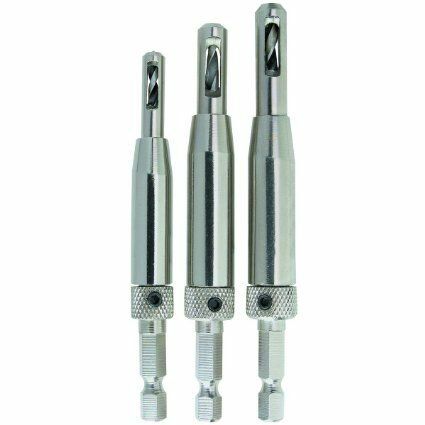 Here is another option… self centering drill bits. A set of three sizes runs $6-24. The ends of the cylinder is tapered, so even if it doesn’t fit the bore exactly, it will still be centered. If you have a shelf-drilling jig, you may already own one. I second pintodeluxeʻs solution. Rockler also sells a set for $30.00. I use these all the time. Drill the centered pilot hole in one swell foop. I’m not sure I could get those self-centering drill bits in at 90 degrees. I use the punch for the initial placement, then remove the hook so I can drill the hole. It’s a great punch! So good, that someone liberated mine from work. Those self centering vix bits are nice. Sometimes you don’t want the screw exactly centered or at a right angle. Center punch makes this easy to do. I agree! I wouldn’t be without them for centering screws in Hinges and whatever else. Lee Valley has the same ones you bought for about the same price. I opted to go with a different set after going there and looking at them. Not saying mine is a better set, they just suited my needs better, and a set of three for various uses was $23.00. Price was not a factor in the buying decision. They are also Spring Loaded and Adjustable Tension. Thanks for the Review Charles. Automatic center punches are great, and Starrett makes the absolute best IMHO. I’ve use one as far back as I can remember (50s or 60s); and, I prefer the all steel ACP to the aluminum body, especially the ones with replaceable tips. For centering hinges (and anything similar where it will work), I agree the vix self centering bits are the best. However, not all self centering bits are equal. I had great luck with the original vix bit (c.f., http://vixbitsonline.com/ ) and mediocre with other brands. $47!!! I have the five dollar version from the homer depot and it works fine for my needs. I use it for installing door hinges. A full set of sizes might be nice for smaller cabinet hinges. Well made tool but I wish it was offered in a smaller size, more suited to box hinges and lock hardware. I was using this tool again today and was reminded how helpful it is. 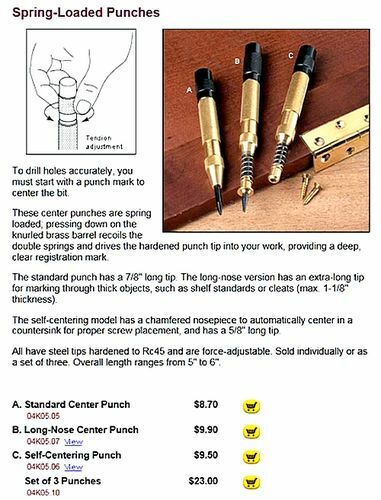 A self centering punch is useful, but unless you use a brad point drill, you won’t get a concentric hole. Ordinary twist drills will go off center every time in both soft and hard woods. You need to use a very high speed with the brad point for reliable results. This is more or less a tip, not an endorsement or negative view, and certainly having a Starrett gives one peace-of-mind that you are using the best available.